This is one of the most extreme adventures we feature, but what an adventure it is. You are sure to come back from this trip with a huge sense of achievement and a real understanding of the Arctic. Importantly, though, you are also sure to come back with an admiration for the huskies with whom you have spent the last 7 days. These dogs are truly remarkable and you will develop a wonderful bond with one another. 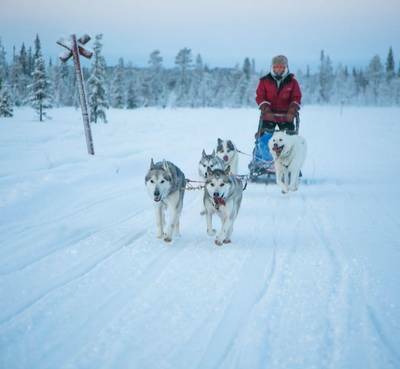 This is the ultimate dog sledding expedition as you spend seven days in the company of your loyal team of dogs, forming a wonderful bond while experiencing the true Arctic wilderness. This should be reserved for those with a sense of adventure but the challenge is exceptionally rewarding. 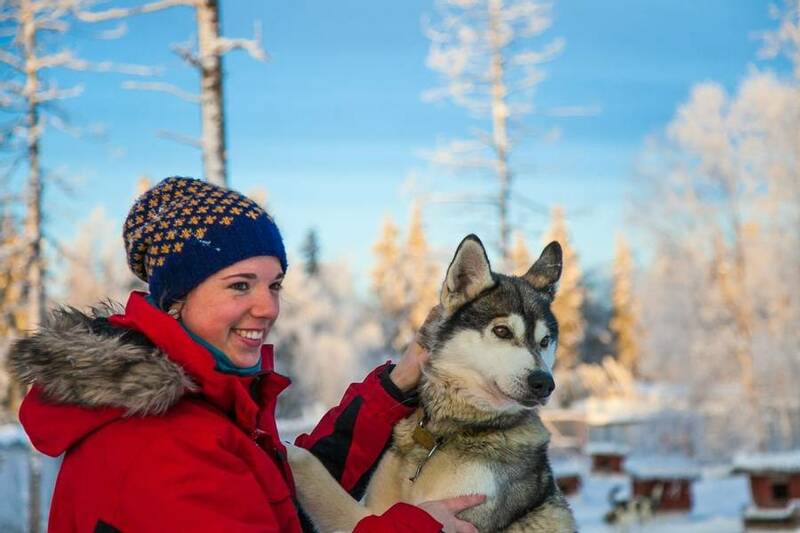 Activities (order subject to change): 7-day dog sled safari with your own team of dogs. A note on flights: Whilst flights are not included in the holiday price, our team will happily provide a quote and arrange them for you. Simply ask one of our travel experts for details of the available options from your preferred departure airport. Direct flights are available on some dates and our team will offer you the best available flights and fares. 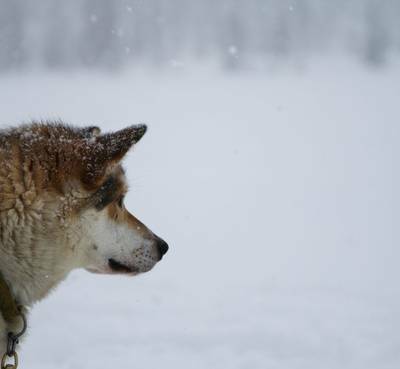 If you have experienced an overnight husky safari then you are likely to have been left wanting more. For those with some experience, this expedition is the real deal. 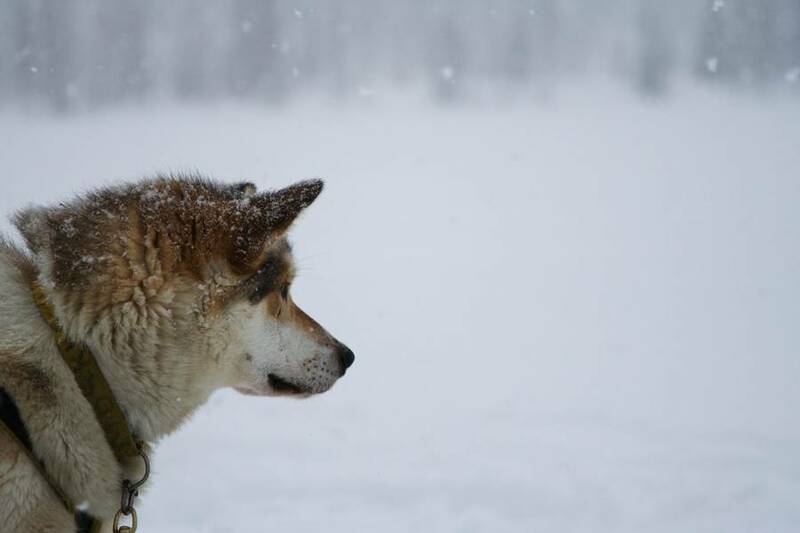 This holiday is not for the fainthearted and you will spend 7 days out in the wilderness, in the company of your own team of huskies, exploring the wilds of Lapland. 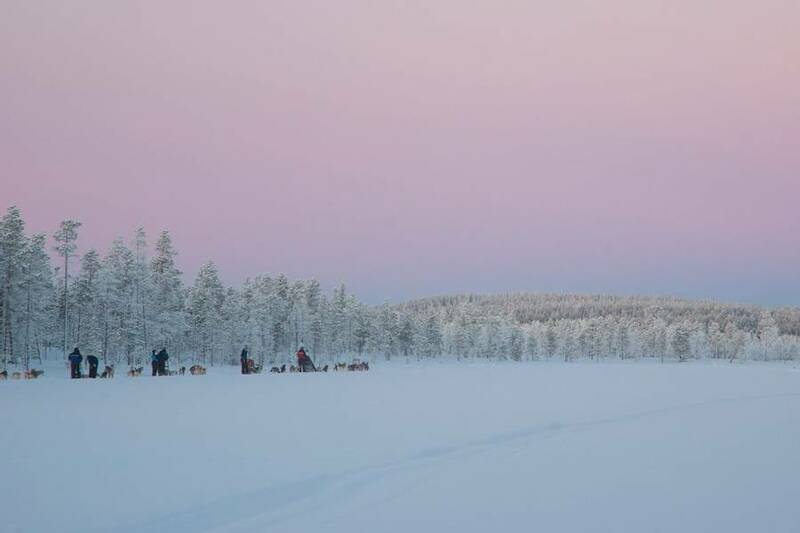 The sense of adventure during this winter holiday is hard to beat and it really is an expedition like experience, covering around 300km over the 7 days, and reaching areas of Lapland that few visitors ever get to see. This is the best chance that anyone can have to really form a bond with the huskies and, as you work together over such a long period, you will truly become a team. You will look after the dogs throughout, feeding them and settling them down for the night, they are your responsibility for the entire time. 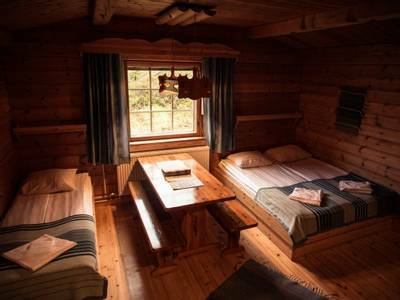 As a group, you will all work together during your four nights in the wilderness cabins and will collect firewood and help prepare the evening meals. This all helps to build a sense of camaraderie that is very hard to find in the modern world. This is not a sugar-coated experience and guests must all work together at the camps and get their hands dirty. The terrain is varied and wild, rugged yet beautiful and the experience is sure to be one that you will never forget. 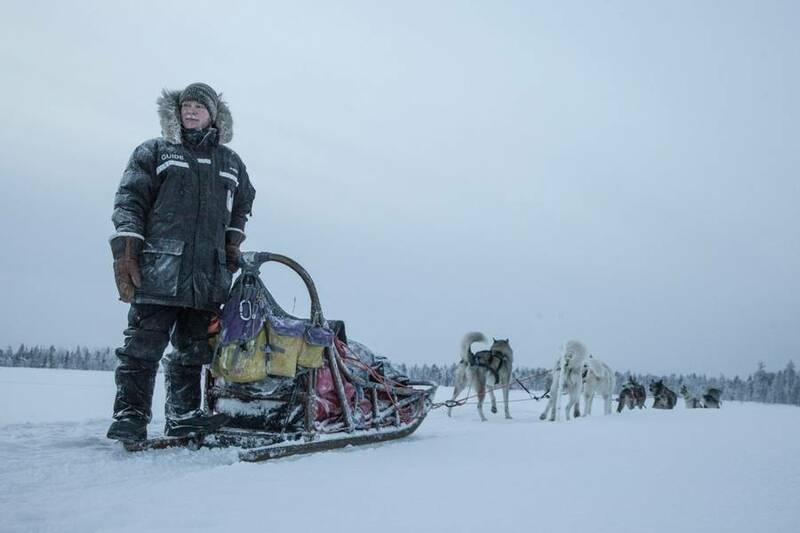 A good level of physical fitness is required to participate in this husky dog safari as well as previous dog sledding experience, ideally an overnight expedition. 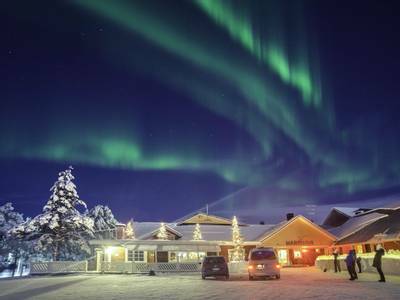 If you would like to finish off your holiday with something extra special then we can arrange for you to spend the night in either an Aurora Dome or in a snow room at Torassieppi Winter Village. Suitable for: Ages 18+ with a good level of physical fitness. See Day 2 of the Agenda for further information. From the airport, you will be transferred to your shared accommodation for the first night of your holiday. 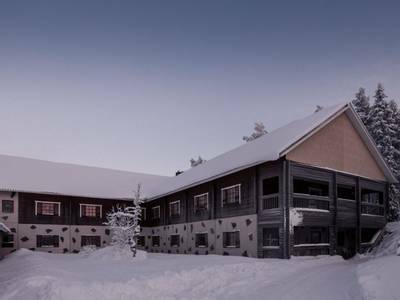 This will vary depending on availability but could be at any of the Pietikäinen family’s three hotels or a safari house located near the Harriniva Wilderness Hotel (max distance of around 5km). 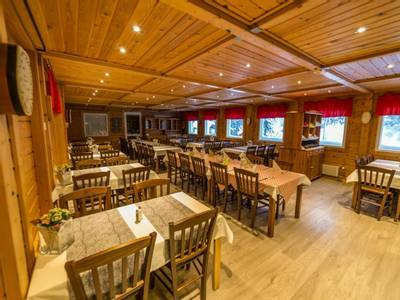 If you are staying in one of the hotels then you will enjoy your evening meal in that hotel reception, if you are staying in one of the safari houses the hotel will provide a minibus to take you to dinner. You will be provided with full information regarding your accommodation for the first and final nights of your stay upon arrival. If you would like to upgrade to a private en-suite hotel room for the start and end of your stay then please ask our Travel Experts for a quotation. Stock up at the breakfast buffet this morning ahead of your first day on the trail today. First on the agenda is a meeting with the experienced guide who will accompany you during the expedition. They will give you some detailed information on what to expect. 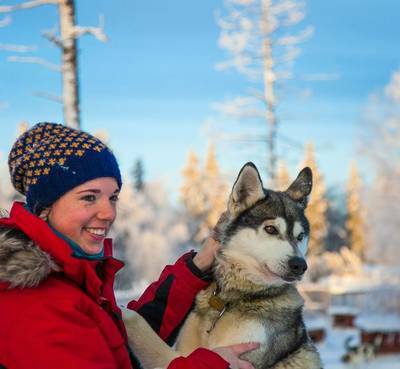 You will then all head to the sled dog centre to meet your teams and prepare. 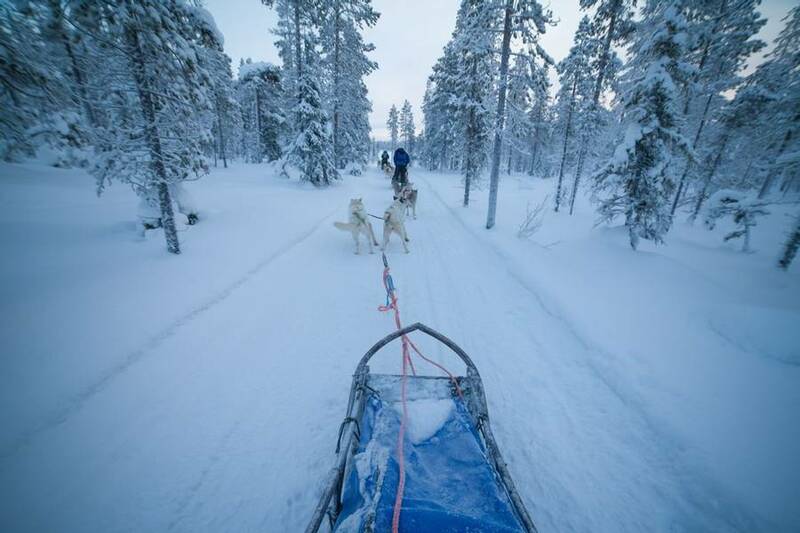 You will be given all the necessary training and the guide will help you pack your sled securely. You'll need to travel light but also carry all the essentials for the coming six nights. 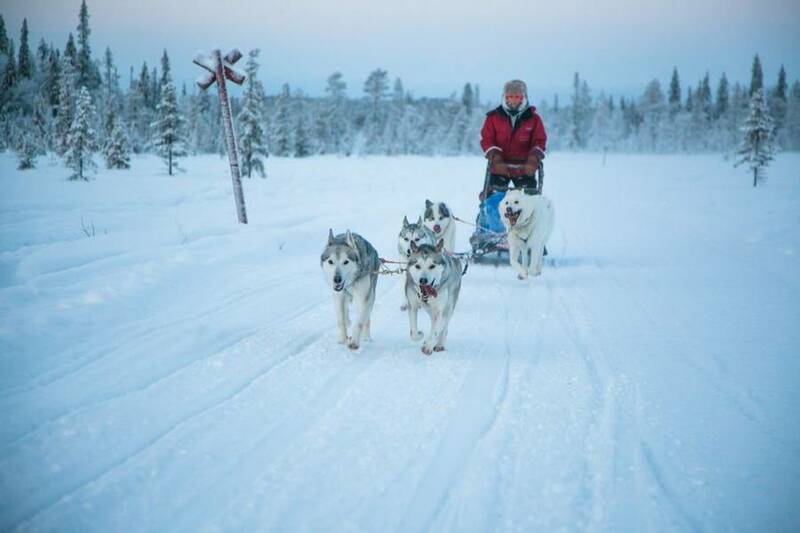 Filled with excitement and spurred on by the overly excited and often loud husky dogs you will make your way out of the centre and into some of the wildest terrain in Finland. After all the preparation it will suddenly be time to leave. As you release the brake on the sled and wave farewell to the centre, there is sure to be a huge sense of excitement and anticipation for what lies ahead. This is likely to be one of your shorter safari days and your destination will be a wilderness cabin where you will set up camp and spend the night. To fully enjoy this holiday you do need a good level of physical fitness. Temperatures can be anywhere between -5ºC to even -45ºC but the thermal clothing you are provided will keep you toasty warm whatever the conditions. 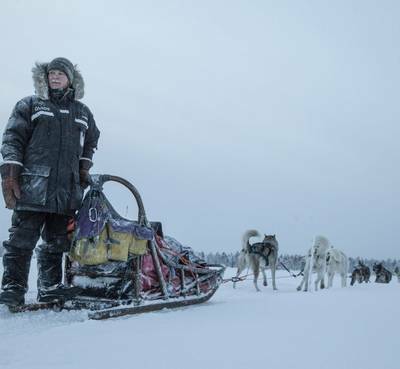 You will spend long parts of your day standing on the runners of the sledge for a few hours at a time but when required you may also be needed to walk/ jog behind the sledge for a short period and help the dogs push the sledge up any short hills (which are few and far between in this part of the world). Anyone with any recent injuries or longer term medical conditions who would like to discuss the level of physical activity required are more than welcome to speak to our travel experts who have all been lucky enough to take part in husky safaris of varying lengths (and are all manner of ages and levels of fitness too!). 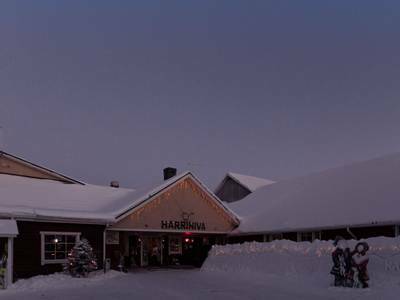 Over the seven days, this journey will lead you from Harriniva to Palojärvi, the final village in Finland before the Norwegian border. During your journey, you will travel anywhere between 30 and 70km per day and this will, of course, depend entirely on the weather and trail conditions. The dogs' health and well-being will be taken into account at all times and your guide will continually assess the routes and conditions. Your accommodation during your journey will primarily be in wilderness cabins but you will also enjoy a two-night stay at Galdotieva Fell Centre which offers relative luxury in comparison to the wilderness. At Galdotieva, the cabins have indoor toilets and showers for guests to use, whereas in the wilderness such luxuries are not provided. The wilderness accommodation is truly back to basics as most cabins do not have electricity or water. Facilities are all shared and the sleeping areas tend to be in dormitory style. 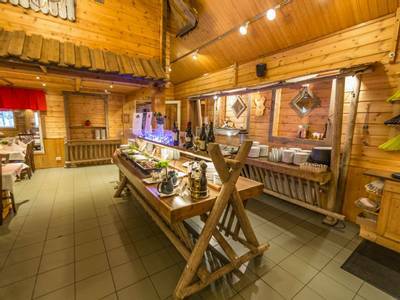 There is typically the luxury of a sauna however and guests can enjoy a bit of a steam clean after a day of mushing. As a group, you will all pitch in collecting water, firewood, cooking and setting the fires, which will develop a real sense of camaraderie. Throughout, the dogs are your responsibility and their care will be your main priority each evening. You will all be working as one team and are sure to bond, their welfare is therefore of the utmost importance. 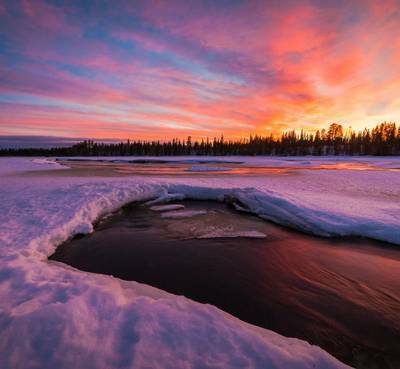 This expedition takes place at the perfect time of year when the days are growing longer and the temperatures are typically less extreme than they can be during other periods. This means that you can enjoy long days on the trails and can really get to take in this spectacular and varied landscape at its very best. You will return to Harriniva in the afternoon today. You are sure to welcome some home comforts but the day will also be tinged with some sadness, as you must bid farewell to your dogs. Following the goodbyes, you will be reunited with warm showers and any fresh clothes you left at the hotel, prior to a delicious celebratory meal in the restaurant. Here the group will gather to recap the adventures and to remember all of the highs and lows of this exceptional experience. 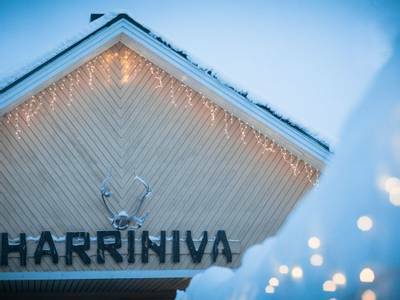 Your final night will be spent back in the safari house at Harriniva. 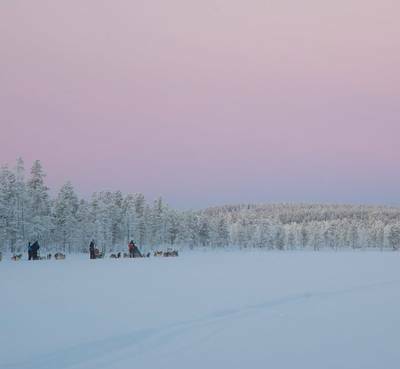 If, however, you would like to spend the final night somewhere rather different then we can arrange for you to sleep in either a snow room at Torassieppi Winter Village or in an Aurora Dome. See the 'personalise' section for details. 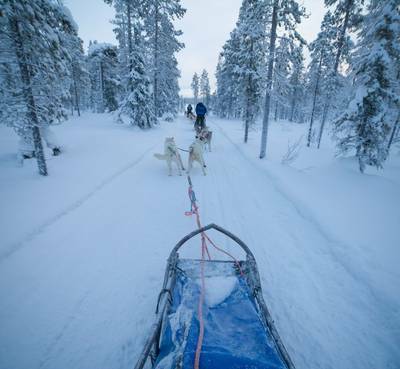 Today it is time to say goodbye to Lapland as you are returned to the airport for your flights home. If you would like to extend your stay to try some additional activities then please do not hesitate to ask our travel experts for a quotation. 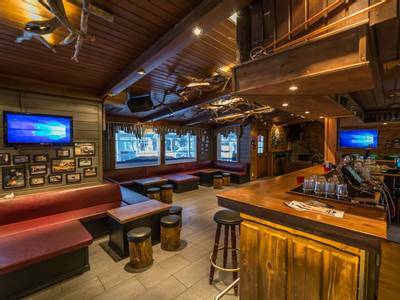 For something totally different, we can arrange for you to spend the night in Helsinki en route home. See the 'Personalise' section for details. Situated close to the Norwegian border, Galdotieva Fell Centre is a spectacularly isolated spot on the route to Norway, which will play a significant part in your wilderness adventure. With very few cars or people passing this way, the vast landscape will take your breath away. The shared cabins have a perfect position to capture remarkable views across the frozen wilds with nothing else in sight so you can experience uninterrupted views of the Northern skies and the possibility of exceptional Aurora viewing. Galdotieva can accommodate around 50 guests in a total of 10 cabins. Our guests stay in one of the four larger cabins which sleep four to eight guests. 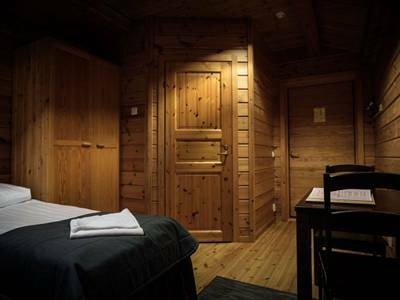 The cabins are simple yet cosy and comfortable providing a welcome retreat after a day of adventures. Each cabin contains a kitchenette, sauna, shower, WC, fireplace and TV. There is a dormitory style sleeping area on the second floor. Wilderness cabin accommodation is reserved for those people enjoying overnight safaris. There can surely be few better forms of escape from the everyday stresses (which could include laptops, mobiles and your day job) than a night in one of these cabins. Their isolation also means that the views of the night sky are incredible – perfect aurora watching territory. The title is fairly self explanatory as the cabins are located in the wilds. The cabins that you visit are determined by the conditions of the trails you are using. They are varied in their set up but all offer the same incredible experience of complete silence in the evening (not guaranteed if you are dog sledding as the huskies do like a howl now and then!). Once the fire is lit, the food is cooked. The guides prepare your meals over an open fire and our guests always provide exceptional feedback on the meals that the guides rustle up (should you have specific dietary requirements, please mention these at the time of booking). There are no showers or bathroom facilities in the cabins but this is all part of the adventure. 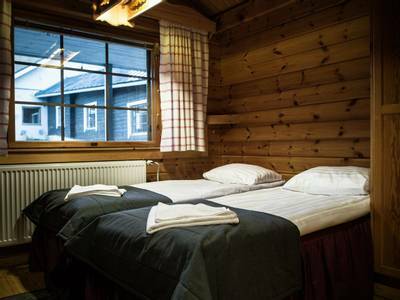 Finland is renowned for its saunas and the wilderness cabins are no exception. 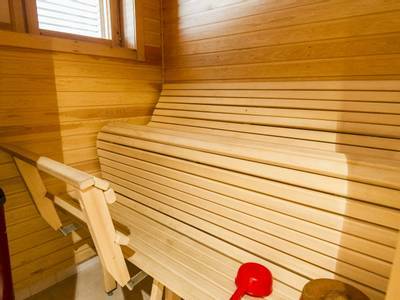 Once heated, you can steam clean in the sauna. The toilet facilities are normally a short walk from the cabin and are compostable. We certainly recommend a head torch for any ventures to the toilet during the night! 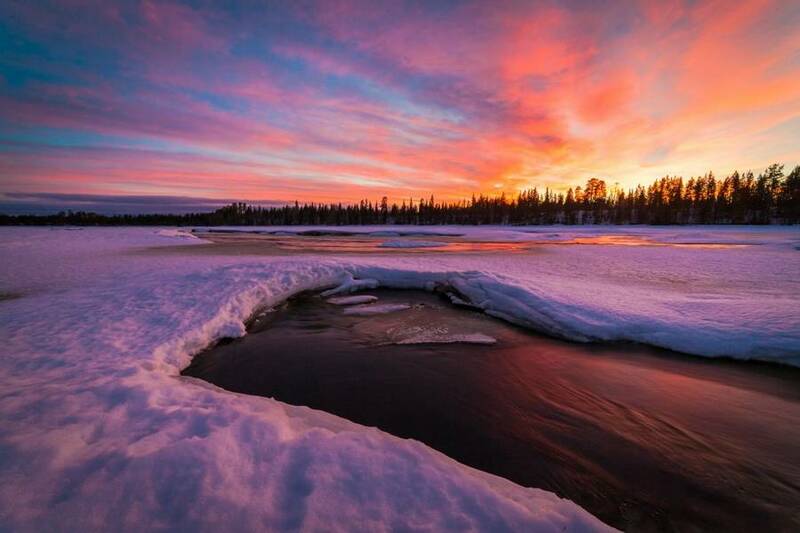 The majority of our remote destinations in Finland can only be accessed by flights that connect through the Finnish capital city of Helsinki so a stopover here is a popular choice. In Helsinki you can enjoy some world class restaurants, a rich culture and a beautiful coastal location on the Baltic Sea. Some of our favourite experiences include a tour of the Ateneum Art Museum, stopping off at one of the city’s many coffee shops and taking a ferry ride out of the main city to visit the incredible UNSECO listed Suomenlinna Sea Fortress. Please note that the included flights will not always allow for a stopover but we shall do what we can to meet your requirements. We would advise getting in touch with our Travel Experts to discuss all of the options available and they will happily provide a quotation for you. Please note: Should you wish to discontinue the overnight husky safari for reasons other than emergency evacuation, you will be charged an evacuation fee of €300.